Non-Toxic PVC Spiral Steel Wire Reinforced Suction and Delivery Hose is also called PVC Suction Hose, PVC Wire Hose, PVC Spiral Hose, Wire Spiral Hose, Wire Reinforced Hose, PVC Delivery Hose, Vacuum Hose and so on, which is ideal hose to draw and convey water, oil, power, granules in applications where require good kinking resistance. The PVC spiral wire reinforced suction hoseis widely used for suction and transfer of water, oil, powder, granules and light chemicals in full vacuum lines, industry pump lines, coolant lines, air conditioning systems, air and water supply lines, washing equipment, and other areas where require tight turns and sharp bends. 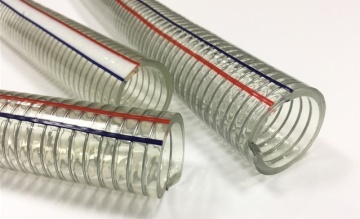 The PVC spiral wire reinforced suction hose is made of flexible and tough PVC, robust steel wire is incorporated within the wall of tube, with smooth inner and outer, transparent wall provide outstanding visual flow characteristics. The PVC spiral wire reinforced suction hose is light weight but robust and abrasion resistant, the tube is crystal clear for easy flow monitoring, high strength steel wire inserted the wall of tube to prevent kinking or collapsing, smooth inner to reduce friction loss, non toxic, silicone free, light chemical resistant, UV and weather resistant, various lengths available, can also be supplied with different type couplings, like camlock quick couplings, pin lug, bauer couplings. The PVC spiral wire reinforced suction hose is not necessarily the most suitable hose to delivery of harsher liquids like oils, fuels, diesels and hydrocarbons, if for such use, pls ask suggestions from us.